Ruby Oliver is fifteen and has a shrink. But before you make up your mind about her, you should know that she has had a pretty awful (and eventful) past ten days. She has: * lost her boyfriend* lost her best friend (Kim)* lost all her other friends (Nora, Cricket)* did something suspicious with a boy* did something advanced with a boy* had an argument with a boy* drank her first beer (someone handed it to her)* got caught by her mom (ag! )* had a panic attack (scary)* lost a lacrosse game (she's the goalie)* failed a math test (she'll make it up)* hurt Meghan's feelings (even though they aren't really friends)* became a social outcast (no one to sit with at lunch)* and had graffiti written about her in the girls' bathroom (who knows what was in the boys'!?!). 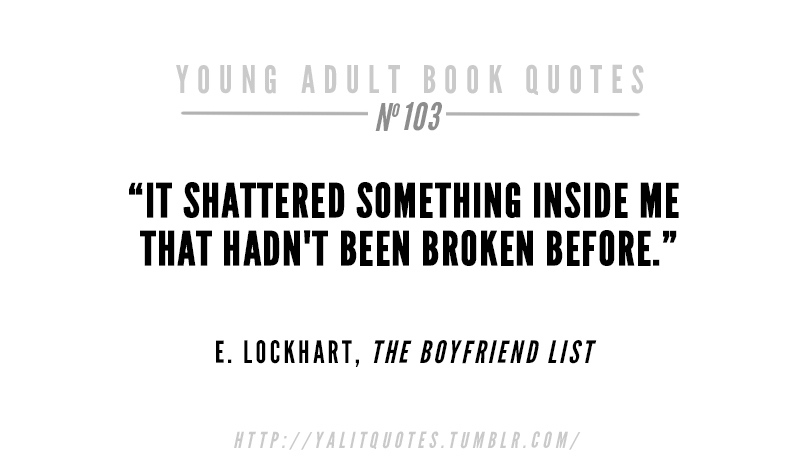 Truth be told, the only other E. Lockheart book I’ve read is We Were Liars which COMPLETELY blew my mind. 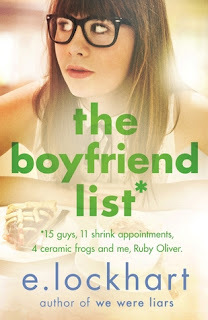 I adored everything – EVERYTHING – it had to offer and so, I had HUGE expectations going into The Boyfriend List. In retrospect, I probably shouldn’t have, but can you really blame me? Well, maybe she was a normal girl. In the last few weeks, relatively normal Ruby Oliver with her popular boyfriend and awesome circle of friends has become a social leper. With her panic attacks, her boyfriend dumping her for her best friend and all her best friends dropping her like a hot potato, the only place left for Ruby is on her therapist’s couch. Oh, and, there’s a list that Ruby wrote that aided her fall – no, crash – down the social ladder. A Boyfriend List. A List of ALL the boys she’s ever been associated with, ever liked or ever done anything with. There are a lot of things I liked and disliked about this book, so let’s go. 1. RUBY’S TERRIBLE “FRIENDS”: When you’re growing up, you make a lot of friends, dump a lot and find the few special ones that you keep. I GET that Ruby is still in the first and second phase BUT I HATED THESE GIRLS. OH GOD. Their friendship moral compass and their decent human being compass were so off, I WANTED TO STRANGLE THEM. 2. THE RANTING: There were SO MANY important messages this book had to give its readers, and they COULD have been properly delivered IF there wasn’t SO much of Ruby Rants. Some of them were funny, but in some, she blabbered on and on so much I had to forced myself through them. Sigh. 3. THE FOOTNOTES: For some reason, I’ve never been able to appreciate footnotes. They pull me away from the point that was being made in the actual story and IT MAKES IT SO HARD TO CONCETRATE. I didn’t like the footnote format of the book, ESPECIALLY IN RANT FORM. SIGH. 2. DON’T BE A PUSHOVER: I have seen so many people be pushed over (I will sadly admit that I’m one of them) and this was one of the BIGGEST lessons that Ruby learnt. 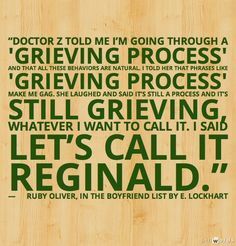 If you’re waiting for someone to call, or wondering why a guy kissed you, asked you out and never spoke to you again and waited and waited for THE OTHER PERSON to do something, then you’re like Ruby (and me.) I loved how this was put across, and just the general importance of teenage girls receiving this message. 3. The Ending: There was this note of maturation that hit Ruby at the ending, which completely changed the tone of the book for me. I WAS SO GLAD she was taking charge of her own life and PUTTING HERSELF FIRST and realising some people just WEREN’T WORTH THE TROUBLE and I was so proud of her. Will I read the next book? I honestly don’t know yet. Ruby Oliver is your everyday girl, which also makes her pretty special. Ruby Oliver is learning things that every teenager should be learning too, and her story is DEFINITELY WORTH READING! What important messages have books given you? 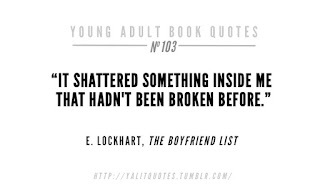 Have you read any E.Lockeart books? Have you read THIS series and if yes, should I continue?